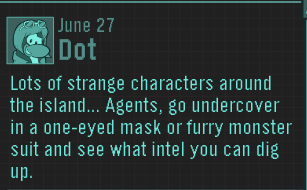 Club Penguin: New EPF Message From Dot! Hello Agents! One of our EPF friends, Dot, has sent us a message! The message is below. "Lots of strange characters around the island... Agents, go undercover in a one-eyed mask or furry monster suit and see what intel you can dig up." Wait..what does she mean by strange creatures? Doesn't she know that there are penguins in costumes...I have no idea what she's worried about but lets just wait and see.